How one teacher creates real-world learning opportunities through "making." By now, most people have heard of 3-D printing. Whether it’s a story about animal prosthetics, demonstration homes constructed in China and Denmark, or printed pizza at a tech conference, tales of this technology are in steady supply. But it's not just engineers and programmers using 3-D printers for science fiction-esque purposes. With some models costing less that an iPad, desktop fabrication is becoming more common in peoples’ homes -- and in classrooms. When my printer arrived, I was giddy with excitement -- and a bit unsure of what to do with it. Last spring, I was one of several thousand teachers across the nation to benefit from an effort by MakerBot to provide a 3-D printer to as many schools as possible. Through DonorsChoose, I received a Replicator 2 printer for less than $100. When my printer arrived, I was giddy with excitement -- and a bit unsure of what to do with it. My MakerBot came programmed to make a dozen demo prints, which I conjured before amazed students, families, and colleagues whenever the opportunity arose. But soon, stretchy bracelets and shark toys lost a little of their pizazz. Sure, I found countless downloads for novel trinkets, interesting toys, and creative solutions for the home, but what I wanted was to enhance educational opportunities for my students using this 21st-century tool. Since I was among the first elementary teachers to have a 3-D printer, online repositories like MakerBot Thingiverse lacked educational "things" (as printable files are often referred to). Sure, I found countless downloads for novel trinkets, interesting toys, and creative solutions for the home, but what I wanted was to enhance educational opportunities for my students using this 21st-century tool. In the spirit of making, I decided my best option was to create those opportunities myself. Not long ago, the knowledge needed to design 3-D computer models required serious training and time. Now, thanks to free online tools like Tinkercad, simplified and accessible 3-D model designing is possible for everyone. Tinkercad is a browser-based platform that is best likened to building with virtual Legos, using a wide variety of easily modified shapes. With a few clicks, your custom thing is ready to print, or better yet, uploaded to Thingiverse under a Creative Commons license for other 3-D printing enthusiasts to print, or modify and share, themselves. Tens frames, used for everything from number sense to decomposing numbers, offered a suitable first design challenge. By merging rectangles and squares, I took my first thing from conception, through design, and to final product in an hour. From there, I designed printable rekenreks (tools for counting/arithmetic similar to an abacus), bathroom passes, and a star-shaped trophy to reward good behavior. Currently, I'm working on a balance with appropriately weighted numbers to hang on the arms, allowing students to physically create equations. I now truly appreciate and teach my students about the iterative design process and how it relates to problem solving. As some of my designs have become more complex, I now truly appreciate and teach my students about the iterative design process and how it relates to problem solving. If my first print doesn't offer the functionality I seek, after a little redesign, I print a new version to see if it fits my needs. And for those curious about the financial and environmental toll of all this printing, rest assured that most things require just pennies worth of material, all of which is polylactic acid -- a rigid, corn-based, biodegradable plastic. Ultimately, my goal isn't just to make things with the 3-D printer for my students to use, but to open their eyes to the possibility this technology offers for creative solutions to everyday challenges. For example, we recently discovered a need at our school when the librarian misplaced her door stop. 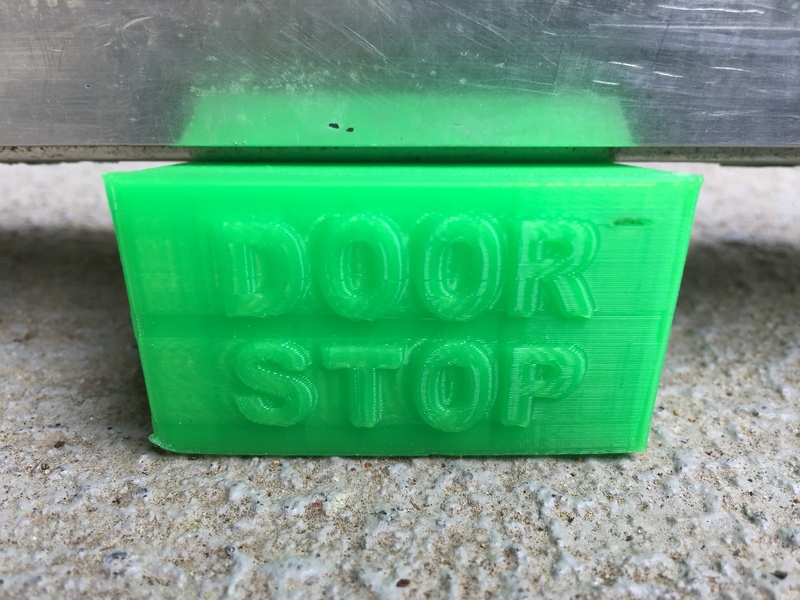 Using Tinkercad, I demonstrated how to design a new door stop while including student recommendations and input along the way. With this simple exercise, my students went from passive consumers to proud creators, an experience I hope they remember for a lifetime. My students went from passive consumers to proud creators, an experience I hope they remember for a lifetime. 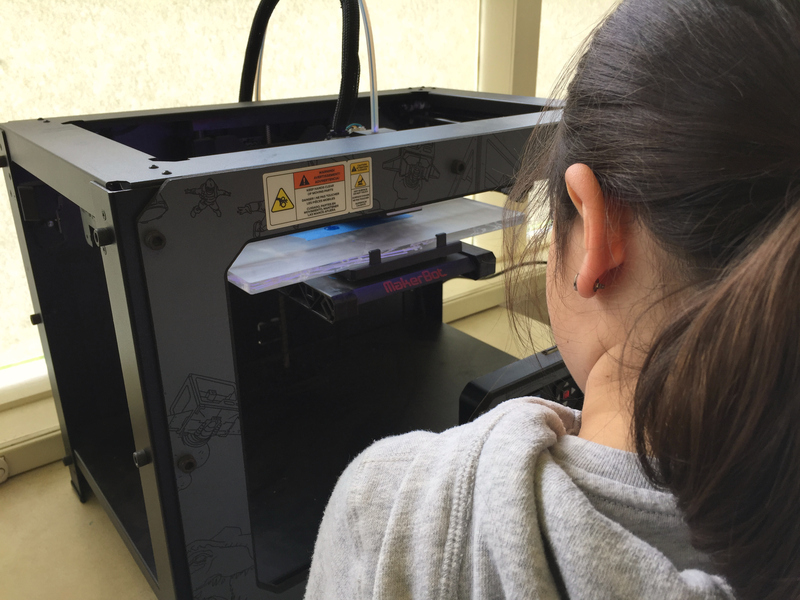 The future of 3-D printing in elementary school is as wide-open as the technology itself. In the coming years, more students will arrive at kindergarten not only familiar with 3-D printing, but some may even have one of these machines at home. In the meantime, I will continue to expose my students to desktop fabrication, following their suggestions for 3-D printed solutions to classroom needs as often as possible. However, what I really want them to take away from our adventures with 3-D printing is that the future is what you make it.